Chat Rating Report | How to access chat rating reports? 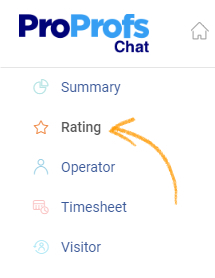 The Chat Rating Report displays the rating given by a visitor to an operator after a chat session. This helps in evaluating the operators' performance and helps them to work on areas of improvement. Navigate to the "Reports" tab from your dashboard, and select "Rating." Chat Rating: It provides a graphical data for the average rating recieved in a day. You can choose to view this data for the weekly and monthly average rating. Also, you can select to view the particular report of an operator. Operator Rating: It shows the average rating of your operators, and helps in analyzing their performance. Overall Average Rating: It provides the average rating maintained by your support team, and also how many chats were rated 'five stars,' 'four stars' and so on. Recently Rated Chats: Tabular data for every rated chat. You can download this data and also view the chat transcript for all rated chats.